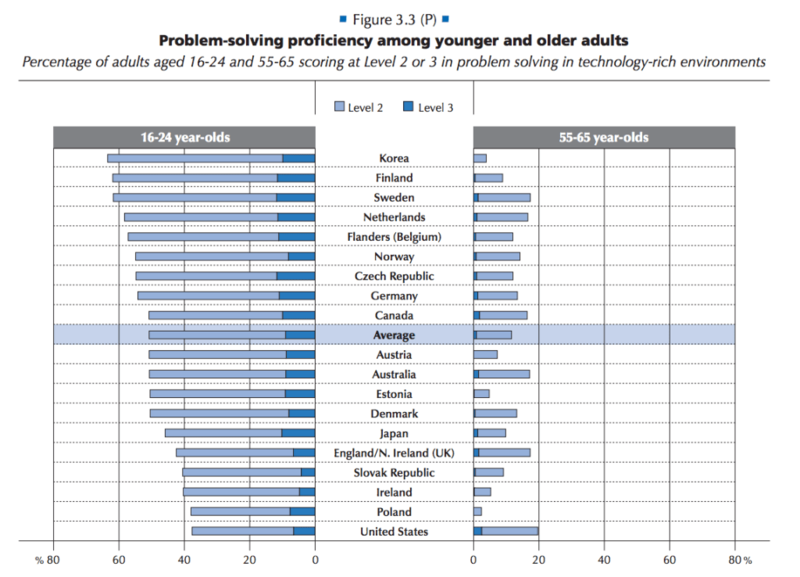 That being good at maths doesn’t necessarily equate to problem-solving skills and that Australia’s old people are better with technology than young people are two of the conclusions that can be drawn from the OECD’s Skills Outlook 2013. The OECD report is interesting in a number of ways for Australia. It turns out Australia scores very highly in terms of adult literacy – which is defined as the “ability to understand, evaluate, use and engage with written texts to participate in society, to achieve one’s goals, and to develop one’s knowledge and potential”. That literacy measure is particularly important because it translates into significantly increased odds of better health, better employment prospects, and better political and social engagement. The countries ahead of us in the list are: Japan, Finland and the Netherlands. The USA and the UK languish a long way behind, as they do in every measure. Literacy, it turns out, is where we are doing best in terms of adult skills. When the Report looks at numeracy proficiency Japan, Finland, Sweden and the Netherlands are the top four places. Australia is ranked 13, just below the average. What makes the maths rankings particularly intriguing is when you compare them with the ranking for problem solving in technology-rich environments. That hoary old shibboleth that being good at maths makes you good with technology doesn’t seem to hold up to the harsh light of some facts. Japan, which tops the maths proficiency rankings, drops to tenth when you look at technology problem solving. Australia jumps up to 6th position. In fact if you were to attempt to draw any conclusion from the skills information about what leads to being good with technology you’d have to say: Nothing. The only conclusion you can validly draw is that once again the Finland, Swedish and Dutch education systems are excellent and a good education makes all the difference. In more detail, though, it is clear that high levels of proficiency in literacy and numeracy go hand in hand with high levels of proficiency in problem solving in digital environments. If you are good at maths and literacy you’ll do well with digital problem solving. There is, however, still a demonstrable correlation between maths and computers: If you perform poorly in maths you’ll likely also perform poorly in digital proficiency. That said, the core conclusion the Report comes to again and again is that high literacy is the crucial measure of success across the board. If you have difficulty with literacy, you’ll have difficulty with everything. Australia’s rankings demonstrably support that contention. Before, however, anyone is tempted to get too complacent about Australia’s overall position, it turns out that we’re in that position thanks to our older adults. Our 16-24 year-olds sit firmly below average. That suggests that our current education system is letting down the younger generation and that any complacency we might have about our overall skills is going to be short-lived. Although we’re in nowhere near as much trouble as the United States, which scored badly all over the place, but where the disparity between the older generation and younger is horribly stark. Across the board it is very clear that when you look at Finland, Korea, Japan and the Netherlands they have made a concerted effort to improve their education systems which is now paying off. Skills are lower amongst the older generations, but world-leading amongst the younger generation. Australia and other similar countries have simply and depressingly got this the wrong way around. What makes this even worse in Australian terms is that part of the reason our older generation does well is that we import a lot of already skilled migrants – in other words we’re skimming the best graduates off other education systems rather than growing our own. We need to use some of our literacy and problem solving skills to recognise that problem and address how to go about cultivating skills in our own home-grown younger generations. The full OECD Skills Report is available here; it comes in at almost 500 pages and needs some literacy skills, or at least stamina, to attack.